The Cisco Meraki Cloud Management is truly a game-changer. This centrally-managed, cloud-based network infrastructure system has a variety of benefits when compared with most enterprise network solutions. 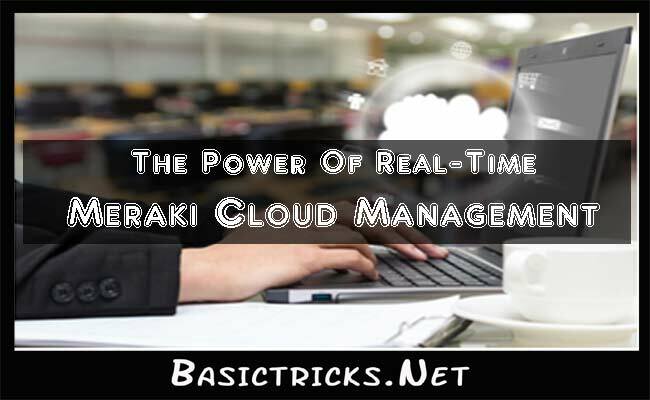 In this article, we’ll take a look at just a few ways that real-time Meraki Cloud management can help empower IT managers, and ensure more efficient IT operations. Cisco Meraki makes it easy to deploy new networks, and easily control the flow of data, and monitor the health of any network. The process of deploying a new Cisco Meraki system is simple. First, specialized Cisco Meraki products are deployed at the office or remote branch – including wireless access points, network switches, and security appliances. These Cisco Meraki devices automatically connect to the Cisco Meraki cloud over an SSL-encrypted connection. Then, they are registered with the network, and configuration information is automatically downloaded. This allows for easy visibility and automatic control of your network, using the web-based Cisco Meraki client. So Thousands of devices at dozens of offices can be reconfigured and changed with just a few clicks, and it’s easy to view reports on performance, or run diagnostics on individual devices – from anywhere in the world! The Cisco Meraki dashboard makes it easy to monitor the network health of each individual piece of network infrastructure. Bandwidth usage, number of clients for every access port, a total number of online users, and event logs can be quickly accessed from any device. Therefore it is an All in one network Management Solution. Cisco Meraki allows for the creation of custom alerts. For example, you could set your Cisco Meraki installation to notify you if repeated requests are made from a single IP address – and a DDoS (Distributed Denial of Service) attack is suspected. You could also configure your installation to notify you if an access point goes down, or if network bandwidth has reached capacity. This helps you stay on top of things, and maintain a proactive approach to network maintenance. All Cisco Meraki products can be automatically updated from the cloud. They can either be patched automatically or on-demand by an IT professional. Typically, updates for all devices are delivered quarterly. These updates increase efficiency, address security concerns, and provide additional device functionality. Cisco Meraki has a large and advanced feature set, appropriate for even large-scale enterprise companies with dozens of offices and branches. However, its scalable cloud-based architecture also ensures that it is inexpensive and easy to deploy – even by smaller IT departments. Because Cisco Meraki can scale seamlessly with companies. It’s a go-to choice for many rapidly-growing businesses who have outgrown their previous IT network infrastructure, and are seeking a more sustainable long-term solution. Cisco Meraki offers advanced security devices like firewalls, as well as many other security tools to help clients secure their networks. In addition, the cloud infrastructure of the main Cisco Meraki system is highly secure. The Meraki system undergoes daily tests for vulnerabilities by third-party companies and has a received a PCI level 1 certification. So this would be very good to go with. Low bandwidth consumption is one of the hallmarks of the Cisco Meraki system. Each Meraki device consumes 1 kb/s of data or less during normal operation. This helps minimize network overhead, and allow IT staff to create a more efficient network – while still providing access to detailed event logs, rich reporting, and easily-searchable databases. See The Power Of Cisco Meraki For Yourself! Whether you are the owner of a smaller company or an IT administrator at an enterprise-scale business. Cisco Meraki can provide your business with powerful benefits. So think about your network infrastructure today and consider whether adopting a cloud-based Cisco Meraki system is right for your long-term IT goals. Top 3 Best apps to Transfer Files from Android to PC.